It's tough to beat the wow factor of the dizzying dictionary of usable words in last year's Scribblenauts for the DS. This year's followup: Super Scribblenauts, doesn't try to outdo that as much as perfect other aspects of the game. For starters, the controls. A loud, frequent request of Scribblenauts devotees, Maxwell gets D-pad controls, and the DS' stylus plus the D-pad moves the screen's camera. He also won't take off at a dead run to a stray touch on the screen, because A) that control has been disabled and B) developer Fifth Cell have slowed him down. 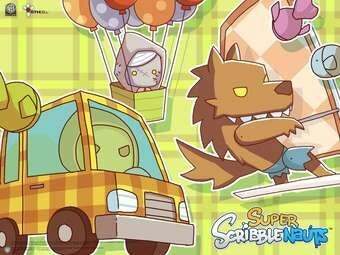 "Some of the improvements were things that we knew were in the last game and had no time to fix, some of it came from feedback from the community," Fifth Cell's Brett Caird told me in my 15 minutes with Super Scribblenauts. Adjectives are the big upgrade, allowing Maxwell to summon even more creative items, animals and personalities to help him solve the puzzles. Modifying something with an adjective requires you either to use the adjective when it is summoned or, after it's summoned, creating a potion that imbues it with that modification. (A winged potion gave my astronaut a set on his back). Yes, you can create an Atomic Ninja. You probably won't want to. Mine stood around pinging off radiation until he exploded, annihilating everything on the screen. A more sensible application was demonstrated in an easy level - Maxwell standing at the back of a very long line, needing to create a distraction for everyone standing in it - in this case gifts that would appeal to each one. The first one I approached was a delivery person (as described by the game's identify tool.) What would she want? Stamps? A box? A dog whistle? Caird suggested that "postal" plus anything would do the trick. I gave her a set of scales - which looked like traditional desk-ornament balance scales but because they were "postal," she was happy and got out of the way. The next character was a soldier. I could have put a military adjective on something (military binoculars?) but tried giving him night vision goggles instead. Caird said the game features 120 levels - 100 of them the puzzle variety, 20 of them the platform-style action levels that he vowed are much harder than in the original. Caird said they wanted to get the game away from summoning God/T-Rex/Cthulhu to get out of every jam. The modifiers are a nice touch but what I saw was just as simple in execution. There's nothing to suggest it's not as good or better than the first game. Given more time (it's amazing how put-on-the-spot you are trying to think of a gift for a soldier) I'm sure I could have come up with some zany objects to solve the level and serve the Scribblenauts spirit. Ultimately, this looks like a sequel delivering more levels and better controls. To be fair, it does have a tough act to follow when it arrives in October.